It's the first time two Oscar winners have been in the same film since 1997! A24, the distributor behind the film, revealed Leo’s role with this amazing still, it shows Brie’s character Joy as she lies asleep in her bedroom. But, who’s that behind her? None other than Leonardo DiCaprio, of course. 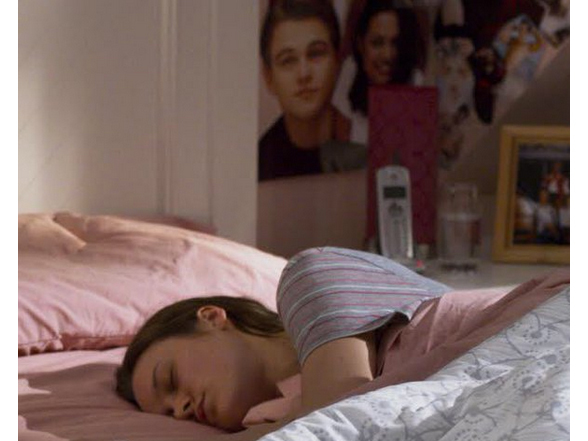 Making his appearance as a poster on Joy’s bedroom wall, Leo technically might not be in the film, but A24 has gone full wish fulfillment, captioning the photo, ‘ROOM: the first time a Best Actress and Best Actor were in the same movie since As Good As It Gets #Oscars2016’. That means Brie and Leo are the first Oscar winners to win from the same film since 1998. And though Leo looks all sorts of gorgeous in his Titanic phase, it’s a stark reminder that Room tells the story of Joy’s kidnapping as a teenager, hence the reason why her bedroom seems stuck in the 90s. Even so, Leo’s in good company by ‘starring’ in Room. The dramatic film won audiences and critics alike, giving Brie her first ever Oscar, with Leo *finally* winning his coveted gold statue for his equally gruelling film, The Revenant. But, let’s not forget that Brie also had long way to go until Oscar fame… In fact, the young starlet used to a be a teen queen. That’s right. 26-year-old Oscar winner Brie Larson used to be a singer, releasing her debut (and only) album in 2005 called – of all things – Finally Out Of P.E. Brie even posts regular #throwbacks to her teeny-bopper phase, clearly showing that she appreciates her varied career path. So, the moral of the story? Anybody can be an Oscar winner… just ask Leo.